A new regulation aimed at protecting seafarers who need to enter enclosed spaces, by requiring ships to carry portable atmosphere testing equipment on board, enters into force on 1 July 2016. Seafarers may be called upon to enter enclosed spaces on ships to manage or obtain equipment, assist a colleague or to inspect vital engine parts. Enclosed spaces are spaces that have limited openings for entry and exit, inadequate ventilation and are not designed for continuous worker occupancy. The atmosphere in any enclosed space may be oxygen-deficient or oxygen-enriched and/or contain flammable and/or toxic gases or vapours, thus presenting a risk to life. The new regulation XI-1/7 Atmosphere testing instrument for enclosed spaces in the International Convention for the Safety of Life at Sea (SOLAS), requires ships to carry an appropriate portable atmosphere testing instrument or instruments, capable, as a minimum, of measuring concentrations of oxygen, flammable gases or vapours, hydrogen sulphide and carbon monoxide, prior to entry into enclosed spaces. Enclosed spaces covered by the regulation include, but are not limited to, cargo spaces, double bottoms, fuel tanks, ballast tanks, cargo pump-rooms, cofferdams, chain lockers, void spaces, duct keels, inter-barrier spaces, boilers, engine crankcases, engine scavenge air receivers, sewage tanks, and adjacent connected spaces. The list is not exhaustive and enclosed spaces should be identified and listed on a ship-by-ship basis. Similar requirements for offshore drilling units enter into force, under amendments to the Code for the Construction and Equipment of Mobile Offshore Drilling Units (1979, 1989 and 2009 MODU Codes). ​Associated Guidelines to facilitate the selection of portable atmosphere testing instruments for enclosed spaces as required by SOLAS regulation XI-1/7 (MSC.1/Circ.1477) have been agreed, to facilitate the selection of a portable atmosphere testing instrument for enclosed spaces. 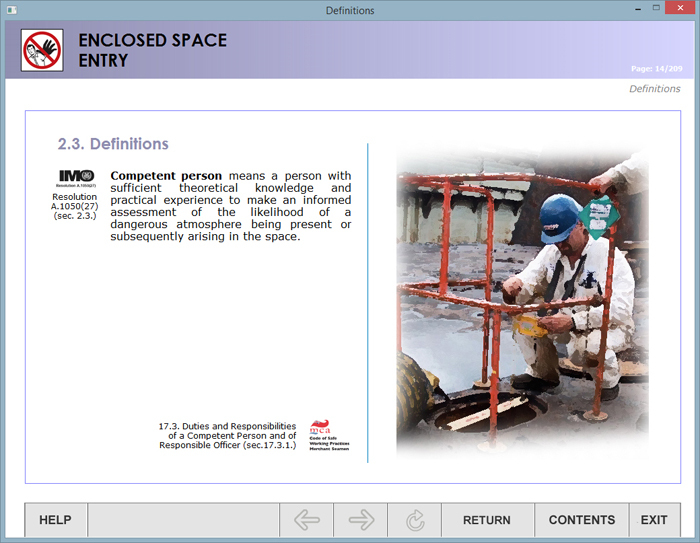 E-learning module is developed in accordance with IMO Resolution A.1050(27) “Revised recommendations for entering enclosed spaces aboard ships”, requirements of Section A-V/1, recommendations of Sections B-V/1, B-V/b and B-V/c of STCW Code and intended for training of marine ships’ crew members on recommendation concerning entering enclosed spaces. Practical recommendations are applied to all ships’ types and used as a guide for seafarers. E-learning module can be used for onboard training and in the educational institutions.